A look at the RISC OS 3.11 graphical interface from Acorn Computers Ltd in the United Kingdom, released in 1992 contemporary with Apple System 7. Please note that I am pretty new to this operating system so there may be inaccuracies and omissions in the text that follows. Many thanks go to David Pilling for his assistance with this article. E&OE. A few years ago, I gained possession of an Acorn Archimedes 440/1 personal computer, running RISC OS. After failing to understand it without a manual and having negative experiences with stability, I gave it away. However, looking around BeebMaster’s site, I viewed his Archimedes pages. The silly error messages from RISC OS I posted to a Bug of the Moment entry, but it was this photograph that really caught my attention: Econet notification. It suggests that submenus can be dialog boxes. Spurred on by this, I had a long trawl through Google Images, finding some curious screenshots. I was going to simply appropriate the relevant images for the Cy/VOS community wiki, but I decided it would be better to install an emulator. This way I could explore the system for myself, find out how it all really works, and take my own screenshots. I present these as a guide to one of the most unusual graphical interfaces around, one that was remarkably advanced compared to other systems of its day and that still has many things to teach those of us designing new graphical interfaces. If we are going to base our work on existing interfaces, why not spice up the mixture with some of the fascinating ideas from the less well-known interfaces such as AmigaOS, RISC OS and Psion’s EIKON. 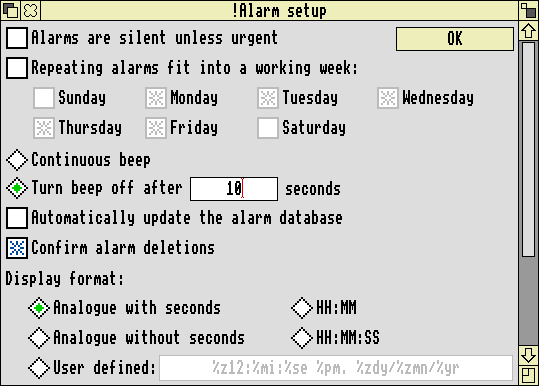 The RISC OS desktop is divided into two areas: the Pinboard and the Icon Bar. The Icon Bar displays the icons of mounted file systems and related special services (e.g. in-built apps and printers) on the left, and active tasks on the right. The rest of the desktop space belongs to the Pinboard, which can show a backdrop and pinned-up icons. The Pinboard does not represent a folder as with common systems, but allows you to pin up symbolic links to files. The pinboard state must be saved to a file in order to be able to be re-opened on next boot. The Pinboard itself is a process which can be closed, removing the desktop background and icons. RISC OS, like the Macintosh, makes extensive use of the mouse to control the system. Unlike the Mac, however, Acorn supplied three-button mice and assigned names and associated functions to all three. The left mouse button is known as “Select”, and functions the same as left mouse in other graphical interfaces. The middle mouse button is called “Menu” and this button provides access to menus; see the section on menus below. The right mouse button is called “Adjust” and is rather unusual. It is similar in concept to Apple’s option key – using the Adjust button performs a similar but different action to Select. For example, Adjust-clicking on a scrollbar button or track scrolls in the reverse direction as Select-click. Adjust-dragging a window moves the window without bringing it to the top of the window stack. Using Adjust to open a file or folder closes the Filer window afterwards, similar to holding option on a Macintosh; likewise, Adjust-clicking a Filer window’s close box closes the window and opens its parent. Adjust-click on a file adds or removes a file from the selection, the same as control-click (Windows) or cmd-click (Macintosh). By devoting a whole mouse button to alternative operations, reliance on reaching for the keyboard to find modifier keys is greatly reduced. Moving a file (instead of copying) still requires shift to be held, however. In general, use of the mouse in RISC OS is much more intelligent than any other graphical interface. 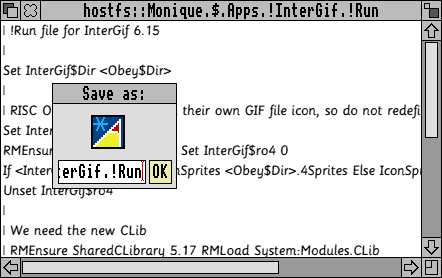 RISC OS does not entertain the debate about in-window menu bars or a global menu bar, as all menus are pop-up menus invoked with the Menu (middle) mouse button. This choice is a strong application of Fitt’s law, as the menu bar opens beside the cursor at all times. Stemming from this, contextual menus are not an arcane secret; there is no strict distinction between a context menu and a standard menu set. To view the available menu options, position the mouse cursor over the window or icon on which you wish to perform a command, and press the middle button. Menus can be invoked for the Pinboard and its icons, Icon Bar icons (but not the bar itself), folder windows and their icons, and the work area of a document window. Title bars, toolbars, scroll bars and non-work areas are excluded; pressing the middle mouse button over the calculator does not invoke a menu. In the screenshot above, I have dragged each menu after opening it. 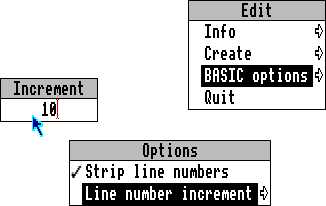 All window dragging – and resizing – is live in RISC OS, including dragging menus. 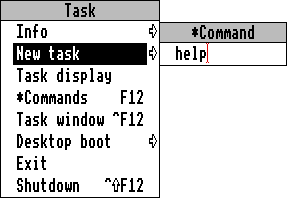 Left-click on a standard terminal menu item closes the menu as normal, but right-click issues the menu command and leaves the menu open for further commands; this is useful for ticking multiple items. Custom menu items allow the user to provide a custom value in a list, such as a custom font size or line width, without needing a separate dialog box. To select a triangular start cap in the above example, you can click Triangle or any submenu that follows. To set a custom width or height, mouse over the appropriate custom field (but do not click it), delete the existing text and enter a new value. You must then left or right click it or press enter to confirm. Enter and left-click will set Triangle as the start cap style and close all the menus. Right-click will confirm the input – which is discarded if you simply focus another menu item – and leave the menus open. This allows you to set both width and height without navigating the menu system twice. This is a feature to insert or remove rows or columns of pixels from the image. You can type the desired number of rows or columns to add or remove, or wave the cursor over the underlying document window: the input box is filled for you. This feature begins to introduce the way RISC OS treats modality. There are no buttons: simply press escape to cancel it, or put the mouse over a parent menu item. The above zoom item does not have a confirmation button; the changes to the zoom level – which curiously can be fractions such as 3⁄2 – take place live. Press escape to dismiss the menu. Windows are in some ways even stranger than menus. Some aspects of them are straightforward: proportional scroll bars, a close box, and a Macintosh-style size box. 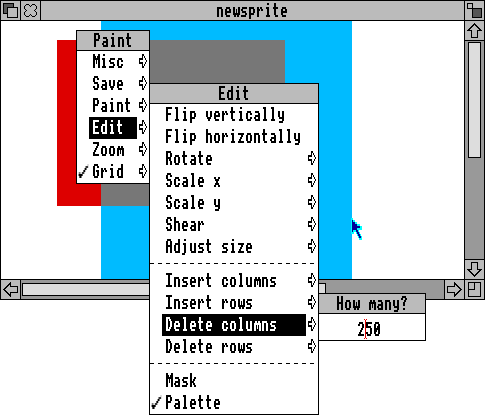 The top-left widget, taken from the Amiga, pushes the window to the back of the window stack. The top-right widget behaves similarly to the Macintosh zoom button. To bring a window to the front, click its title bar or size box. Using the right mouse button, you can drag and resize windows without activating them, similar to holding command on a Macintosh. Very little in RISC OS takes keyboard focus. File system windows do not, for example, nor do menus. The only dialog controls that can be operated with the keyboard are text input fields. Document windows can choose to accept keyboard focus, of course. The !Edit window above keeps the keyboard focus even with menus open, as the menus don’t request the focus. If I move the mouse cursor back onto the parent menu, the input submenu closes and the document window instantly regains focus, and with it, the yellow highlight. Navigating submenus will often trigger the document window’s yellow highlight to flash on and off rapidly as keyboard focus switches between the document windows and submenus that take keyboard focus, which is quite distracting. Note that submenus that take keyboard focus keep their grey title bars, which is visually inconsistent. Dialog boxes, however, do get the highlight. If you disable the active text field in a dialog box, the dialog’s yellow highlight will be removed, as it no longer has keyboard focus. The only way to give !Calc keyboard focus is to click in the calculator’s display area! !Edit’s menus appear above !Calc’s window, but the !Edit window itself remains resolutely at the bottom of the window stack. Inserting characters into a menu text field is slightly different. Clicking into the !Chars window would snap the menu shut, so you hold the cursor over the desired character and tap the shift key! This approach works at all times, but clicking the characters is generally more convenient. Spaces in filenames are forbidden, and spaces are also forbidden in minimised icon titles, so each icon’s caption is the window title up to the first space. Double-click restores a window, but they do not affect the Pinboard menu unlike pinned file and folder icons. Some minimised window icons contain a file type icon of the related window, but many do not. 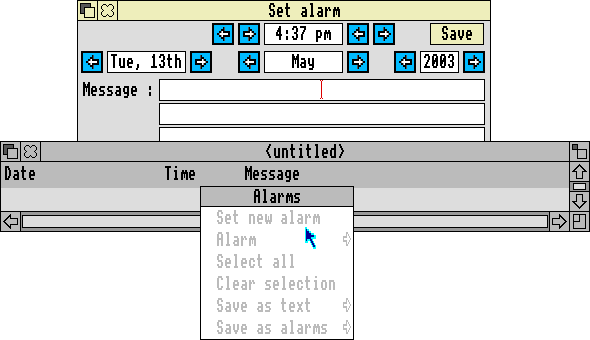 In the following example, the top window is a dialog opened via the bottom window’s Set new alarm menu. Although you can return to the parent window and open the menu again, the menu command is now greyed out. The menu item does not carry an ellipsis. 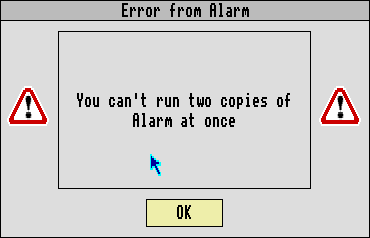 This is not obvious, as the error dialog implies that the OK button cannnot be used at all. Note that in the above situation – pressing F3 to save – the Save dialog box is shown as a regular dialog box. RISC OS does not have Open dialogs of any variety. To open a file with a program, the program must be launched first and the file can be dragged onto its Icon Bar icon or an open window. Unlike Mac OS or Windows, files cannot be dropped onto a program’s icon. Nor can they be dragged onto a folder’s icon: to move a file into a folder, it must be dropped onto the folder’s open window. More confusingly, files are by default always copied, never moved. To move a file, hold shift while dragging it. Like its predecessors, the Acorn BBC Master Series, the Acorn Archimedes started out with non-square pixels in the default 640×256 resolution. The mouse cursor, icons and the system font are all designed for pixels that are twice as high as they are wide. When using a more standard 640×480 screen, this leads to system text and icons having a disturbingly low-resolution look on a screen that otherwise appears relatively high resolution. Sub-pixel anti-aliasing in this context (at a time that predated colour flat screen devices) means sub-pixel positioning of letters on the screen to achieve fractional letter widths. This feature was also introduced in the Unicode text engine ATSUI in Mac OS 8.5, but since Mac OS before X did not support smooth type, the only result was mis-spaced letters rather like the first screenshot above, but more pronounced. Only with Mac OS X did any mainstream graphical interface provide the smoothly rendered, fractionally spaced type that Acorn accomplished in 1992 or earlier. The disparity between system text and application text, however, is especially clear. By 1997, Apple had got around to displaying a pre-rendered image of anti-aliased text. KDE users are likely to be familiar with this theme, as it was created as a KDE theme. Notable omissions from this version supplied with UniBoot include the window backgrounds, menu separators and an anti-aliased full-resolution system font. A basic pictorial overview of the interface can be found at the GUIdebook gallery.